If you're self-conscious about your lack of singing ability, Rock Band 3 has you covered. Everyone likes playing guitar in Rock Band, because everyone wants to be the guitar god. They like playing bass, too, because it's just like playing guitar only easier. They sometimes like playing drums aside from that damn bass pedal, because hitting things is fun. But more often than not, those same people refuse to be the singers. Why? Well, it probably doesn't help that you can play guitar, bass and drums on the easiest difficulty and still sound cool in the game, but off-key singing is off-key singing, pure and simple. "Audio signal processing company" iZotope and Harmonix have announced a deal to use iZotope's pitch-correction technology in Rock Band 3 to make your lousy caterwauling sound almost palatable. Of course, it won't change what you're actually singing, but it'll make what you hear in the game that much more tolerable. 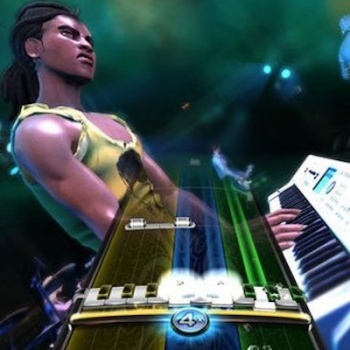 "Rock Band 3 provides players with the option to enable vocal effects commonly used in the music industry, assisting players to sing on key more easily with pitch correction and bringing the tools that pros use into the living room," said a Harmonix representative. "Rock Band is an ideal platform for us to showcase iZotope's technology so we can provide gamers with studio-grade audio effects that professional mixers, sound designers and others in the entertainment industry have relied on for years," echoed iZotope's Mark Ethier. Now, maybe it's just me, but I can't help but feel like this is slightly missing the point. Isn't half the fun of karaoke (which includes Rock Band) just belting Don't Stop Believing at the top of your lungs with nary a care for what you actually sound like? Won't the on-tune you coming from the speakers conflict with the out-of-tune you actually singing? But on the plus side, maybe this means I'll finally get to fulfill my lifelong wish of playing a music game where I get to sound like T-Pain.